Tyler M. here with another installment in my Building a Better Model series. This time I take a look at Shrike. This project was a little unexpected and I only had a day or two of planning before I got started. I decided that I was going to paint a Shrike model for my friend's Raven Guard army as a gift. Originally I was just going to paint the stock model since I have had it laying around unpainted since it first came out almost a decade ago. 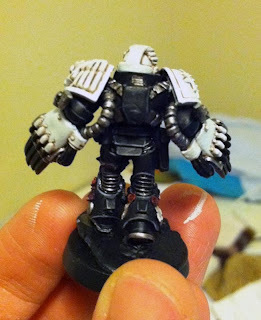 After some discussion with my friend (while trying to keep the whole thing secret) we both decided that the original model was a little odd and has aged quite a bit. To me he looks a little bit like he is doing some sort of interpretive dance or joyfully leaping about. Not exactly the image you want for someone described as being a cold-blooded ninja master. I liked a lot of the armor design minus a few things, such as the super bulky smoke launcher on his jump pack, so I decided that I would try and keep many of the key aspects. After some toying around with the idea of building him entirely out of plastic marine parts and greenstuff I went with an easier course. I spent an hour or so searching through the GW website looking for a model that would inspire me and came across the new Lord Executioner. 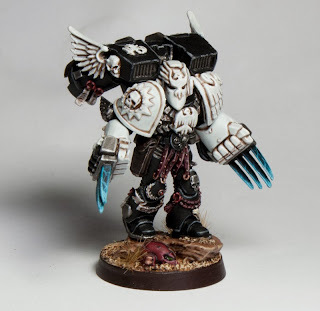 It had all the coiled menace and promise of violence I was looking for, calm, collected and ready to pummel the xenos and the mutant into the ground. One quick stop at my local hobby store and I was ready to go. 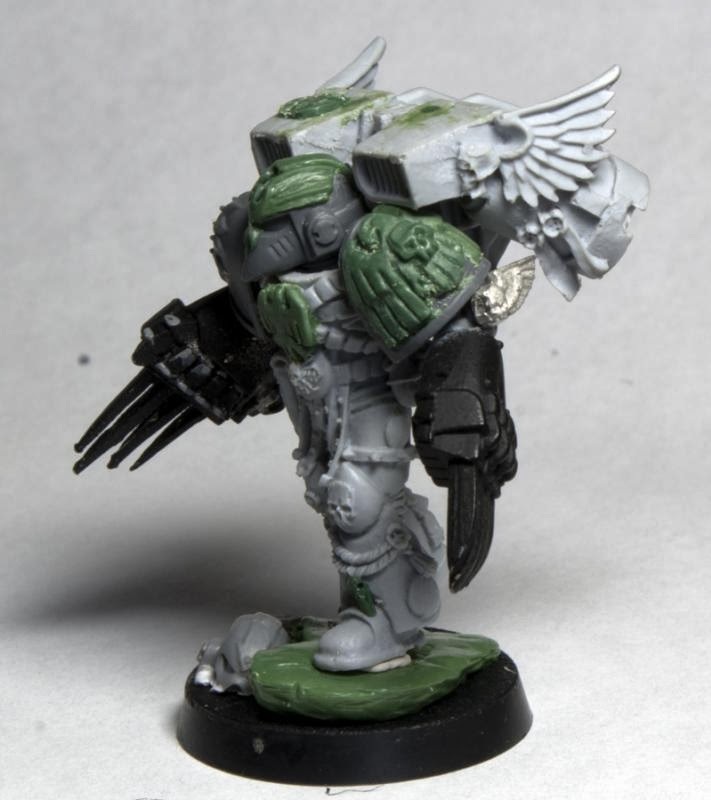 Say what you will about Finecast, but it is very easy to convert. All I had to remove from the stock model were the arms which cut off easily and I damaged almost none of the other detail. The less clean up the better. 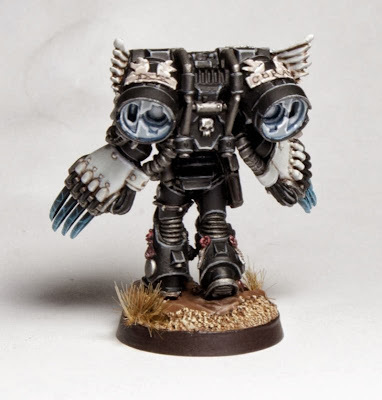 Searching through my bitz box I found some arms that worked and 2 lightning claws, one of which was Shrike's. Keeping the original model on hand for reference I started my cutting and sculpting. Unfortunately I didn't take any in progress shots of the build, but it's fairly obvious to see what I sculpted and what I moved around. 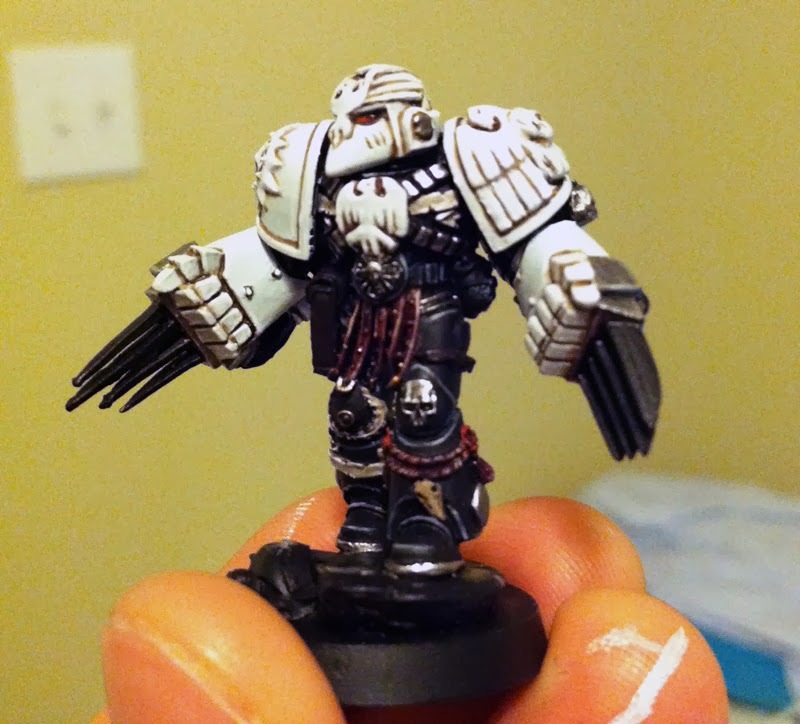 The head eagle was the hardest to sculpt, just very fiddly. 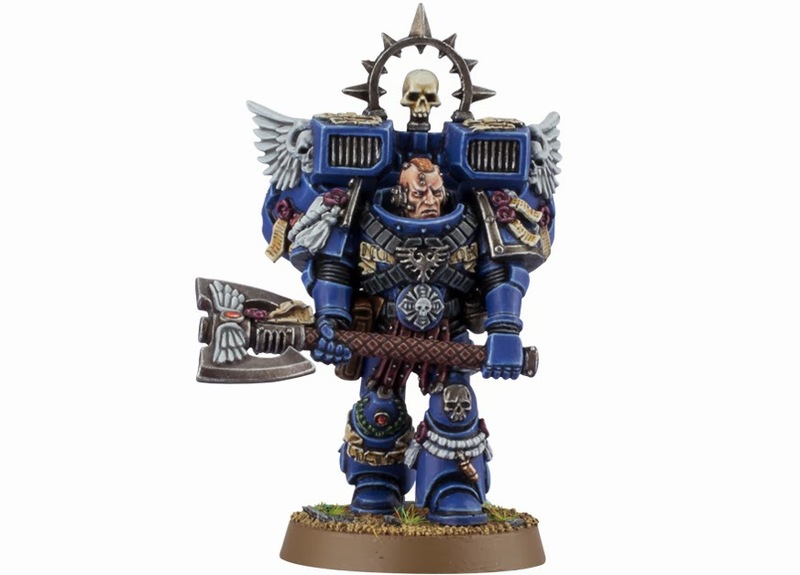 One problem with the new apocalypse marine captains is that they are all slightly smaller then a standard marine. 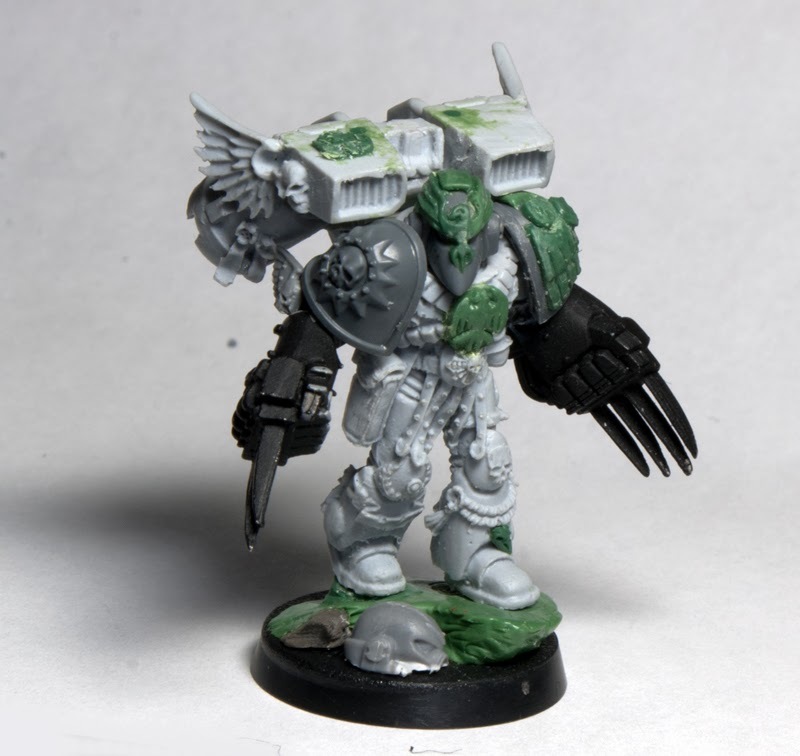 I couldn't have Shrike being smaller then the marines he leads so I built up a small rocky out cropping for him to stand on. 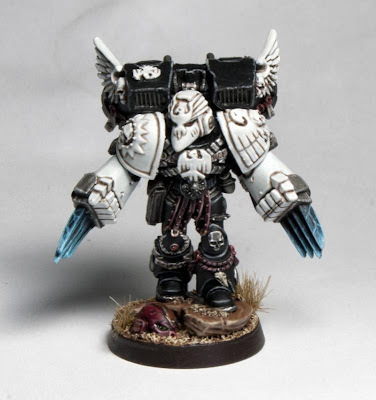 For some reason when I think of the Raven Guard I always think of them fighting Orks but decided to add a defeated Chaos marine helmet to the base as it was easier. 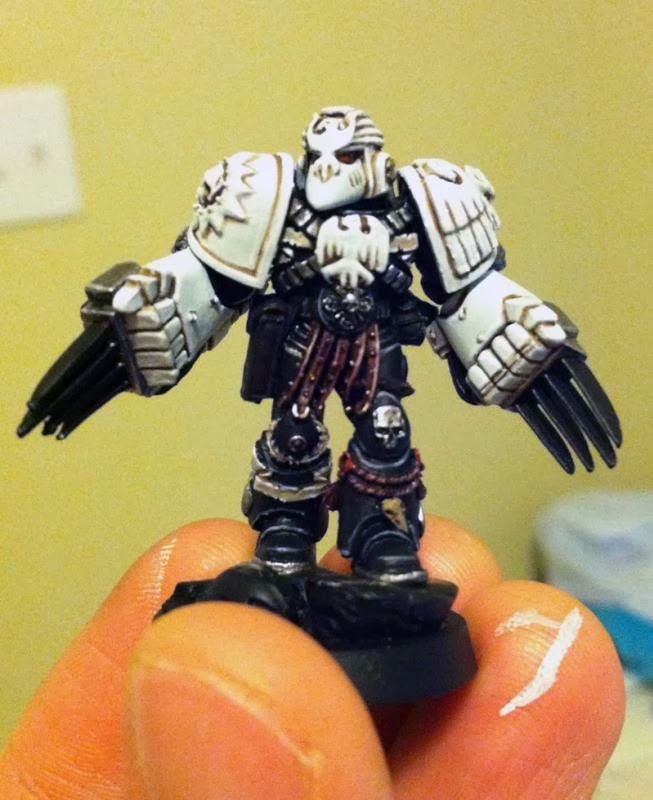 Once I started painting I decided to give him completely white shoulder pads, like all of the other Raven Guard captains and veterans. 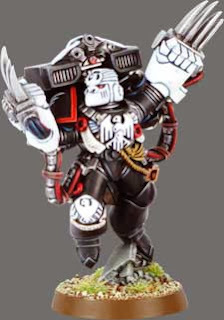 I had to find another place to work in the red to indicate him being of the 3rd company so gave his leather tassels a reddish brown look as well as the rope on his leg. I love doing lightning effects on power weapons so I knew I would have to do that for his claws. The Chaos helmet got a red and brass treatment to help complement the red on the model and contrast with the black. Again for some reason I always picture the Raven Guard in a desert setting, I must have seen some artwork when I was younger with them fighting Orks in a desert, who knows. 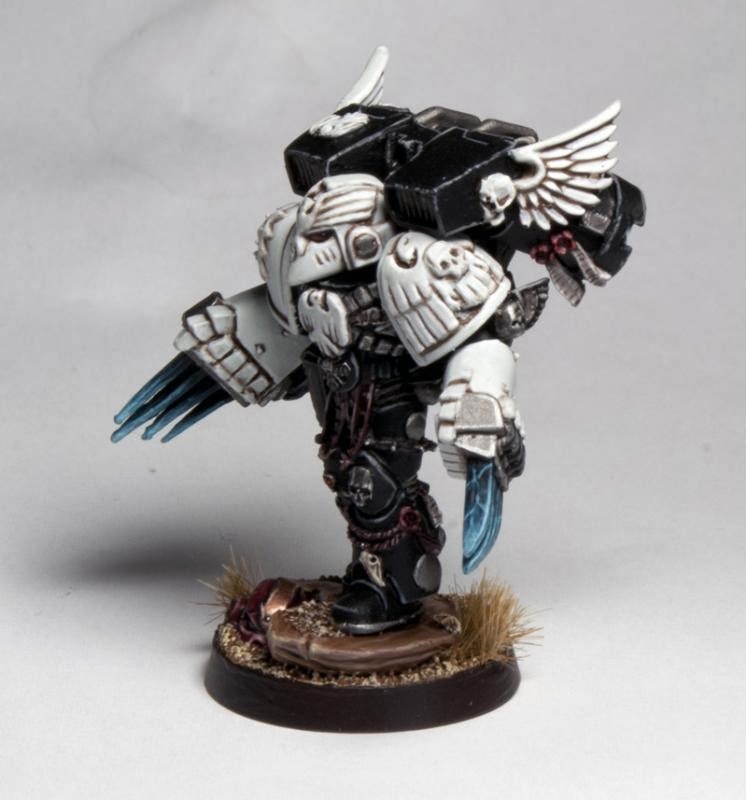 This also helps frame the model since it is so much lighter then his predominantly black armor. 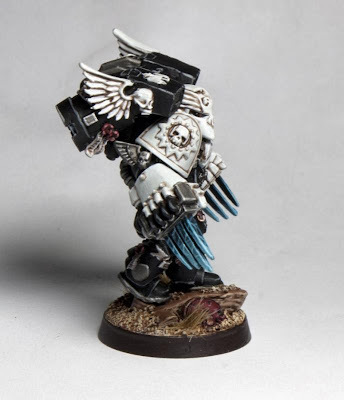 I am very happy with the model and feel that embodies the character of Shrike much better then the current GW one. It is all about the promise of violence, not the actual visualization of it. I apologize for this article not being as in depth as my Typhus one, but like I said, it was unplanned. I hope this helps inspires you to take the path less travelled and make your own spin on your favorite characters.